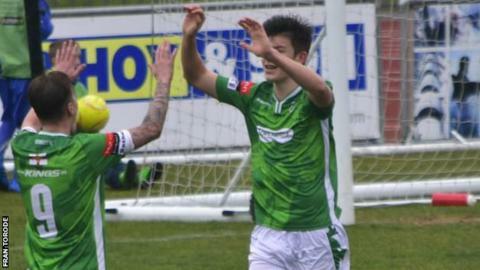 Guernsey FC boss Tony Vance has called on his promising young players to impress consistently. Jacob Fallaize scored his first two goals for the club in the 4-1 win over Walton and Hersham, while fellow 16-year-olds Robbie Legg and Seb Smeed also impressed at Footes Lane. Tom Martin, 20, also got his first goal for the Green Lions. "It's three 16 year-olds who've been blooded, played a home game and done really well," Vance said. "It's fantastic to see and it's important that we keep integrating them, keep exposing them as best we can to ensure that they come through. "It's easy to do it in flashes but can they do it consistently? That's my job and their job."